Doesn't it come around quickly? I'll be working on finishing my Christmas Caroling Row a-long Row (that I'm releasing tomorrow!) as a wall hanging and that will be one finish I'll truly have ready for this Christmas. If you're not sure what I'm talking about, take a look HERE and make sure you pop back tomorrow for my turn in the Row a-long blog hop...I'm so excited! 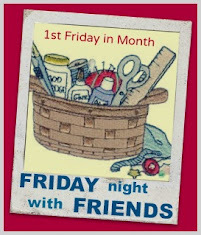 In the meantime, sign ups are below for our fun-filled Friday Night frat party....break out the bubbly, the chocolate and the stitching in our jammies....we're set for a fabulous Sew-In together....and don't forget, one lucky random winner will take home a lucky door prize that you're just going to love! Can't wait to see what you're going to bring along to the night. If you're not sure what our FNSI is all about, click on the FNSI tab above to find out more - everyone's welcome. So, what are you waiting for...join up below and I'll see you there! Oh my gosh! I can't believe it's that time. I realized today that the month is 1/3 gone already! I will be holed up in my Sewing Space - 2 males in the house - 2 TVs - each with a different form of football - erk - where else could I be?? Happy to see so many of my FNSI friends have already signed up! Cant wait to see what projects you're working on this month! I'm going to get the rest of my purple four patches sewn together - by hook or by crook!! Friday night soccer for mr17 is finished now, so I'M IN! Can't wait... stitcheries to trace. WOW third Friday again. Sure comes around fast..
Will be at retreat but will also enjoy joining you Wendy..
My DD and Grandson P are visiting so I will be stitching and Dd brought her knitting.